His parents and his junior high school chemistry teacher shaped the career of chemist Glenn Seaborg who reciprocated with countless scientific achievements, including advancing twentieth century nuclear science, reconfiguring the Periodic Table, and winning the Nobel Prize. In 1922, when Glenn Seaborg was ten years old- he was born in Ishpeming, Michigan, on April 19, 1912- his mother Selma Erickson Seaborg, a Swedish immigrant, convinced his father Herman to move the family to South Gate, California near Los Angeles. Selma wanted Glenn and his sister Jeanette to have broader opportunities than what she felt the small iron mining town in Michigan’s Upper Peninsula could offer. Dwight Logan Reid, Glenn’s junior year chemistry teacher at the David Ataar Jordan High School in the Watts district of Los Angeles, ignited a passion for chemistry in Glenn. Inspired, Glenn worked his way through the University of California as a stevedore, fruit-packer, and laboratory assistant. He graduated in 1934 and went on to earn a Ph.D. at the University of California- Berkeley. Glenn Seaborg became a chemistry professor at Berkeley and spent most of his career there as an educator and a research scientist. Nationally, he advocated science education and federal funding for pure research. During the early part of his career, Glenn helped discover over 100 isotopes of elements and in 1938, he collaborated with John Livingood to create Iodine -131, an isotope of iodine that is used to treat thyroid disease. Years later Iodine -131 helped save his mother Selma Ericson Seaborg’s life. In 1941, using a 60-inch cyclotron Glenn Seaborg and his colleagues Edwin McMillan, Joseph Kennedy, and Arthur Wahl bombarded a sample of uranium with deuterons and transmuted it into plutonium. World War II brought profound changes to Glenn Seaborg’s life. Helen Griggs worked as a secretary for Ernest O. Lawrence, Nobel physicist laureate, and director of what later would be the Lawrence Berkeley National Laboratory. She and Glenn met at the Laboratory and in 1942, they became engaged. Glenn’s war time work on the Manhattan Project had taken him to Chicago, but he returned to California on the train to rejoin Helen and friends expected them to be married in Chicago. Anxious to marry, Glenn and Helen got off the train in Caliente, Nevada, planning to be quickly married and re-board the train. They discovered that Caliente didn’t have a city hall and they would have to travel to Pioche, 25 miles north, to be married. Luckily for them, one of Caliente’s newest deputy sheriffs happened to be a recent Cal Berkeley chemistry graduate and jumped at the chance to help his former professor. He arranged for the bridal couple to make their wedding trip in a mail truck. The wedding witnesses were a clerk and a janitor. The newlyweds continued their journey to Chicago and lived there while Glenn worked on the Manhattan Project and Helen provided essential administrative assistance to the scientists working on the project. Helen Seaborg unfailingly helped Glenn in his career and he often said that he couldn’t have managed or accomplished as much without her help and advice. The Seaborgs eventually had six children, Peter, Lynne, David, Steve, Eric and Dianne. Glenn Seaborg continued to blaze scientific trails. In 1944, Glenn introduced the “actinide concept” of the electronic structure of heavy elements that predicted that the actinides formed a transition series that paralleled the rare earth series of lanthanide elements. His concept showed how the transuraniaum elements fit into the periodic table, creating one of the most sign cant changes in the periodic table since Dmitri Mendeleev designed it in the Nineteenth Century. 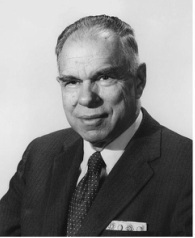 Glenn Seaborg and his colleagues used his concept as a bridge to create a line of transuranium elements including americium, curium, berkelium, californium, and seaborgium. When element 106 was officially named seaborgium in 1997, this was the first time an element had ever been named for a living person. Glenn Seaborg called this his greatest honor. Glenn advised presidents from Harry S. Truman to Bill Clinton on nuclear policy and advocated for commercial nuclear energy and the peaceful use of nuclear science. After the sharing the Nobel Prize in Chemistry with Edwin McMillan in 1951 for his discovery of transuranium elements and plutonium, Glenn received so many honorary doctorates and awards – including having an asteroid named for him -that the Guinness Book of World Records listed him as the person with the longest listing in Who’s Who in America. He also produced over 50 books and more than 500 journal articles. As well as conducting his prolific research career, Glenn Seaborg actively championed science education. He served on President Ronald Reagan’s National Commission on Excellence in Education which created the 1983 report called “A National at Risk: The Imperative for Educational Reform.” He served as Chairman of the Atomic Energy Commission – today the United States Department of Energy- under President John F. Kennedy, President Lyndon Johnson, and President Richard Nixon. He also served terms as president of the American Association for the Advancement of Science and the American Chemical society. He was also instrumental in creating “Great Explorations in Math and Science,” an Internet resource for science teachers. Despite all of his honors, Glenn remembered his Swedish roots. He periodically visited Sweden and his family joined the Swedish Pemer Genealogical Society, a family association composed of descendants of the Pemer family. The Pemer family was a Swedish family of German origin that Glenn was descended from on his mother’s side. One of his most treasured friendships was with Swedish American-dancer and actress Ann-Margret. Although Glenn Seaborg died at the end of the twentieth century on February 25, 1999, his chemical contributions continue to shape the twenty first century. The Plutonium Story: The Journals of Professor Glenn T. Seaborg 1939-1946. Glenn T. Seaborg, Ronald L. Kathren, Jerry B. Gough. Battelle Pr., 1994. Glenn T. Seaborg. A Chemist in the White House: From the Manhattan Project to the End of the Cold War. American Chemical Society, 1997. Glenn T. Seaborg.The Atomic Energy Commission Under Nixon. Palgrave McMillan, 1993.